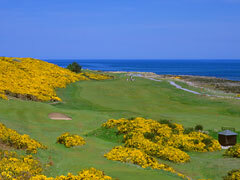 A Season in Dornoch: Golf and Life in... the Scottish Highlands. Royal Dornoch Golf Break. So well is the Championship course regarded, that magazine polls across the world regularly have it in their top 20. Despite being 45 miles north of Inverness it is well worth the trek! Championship Course - The opening hole on the Championship course, a simple par 4, is no indication of the joy – and trouble – to come. It is not until golfers walk over the headlands to the third tee that they get a sense of this striking golf course. Tom Watson came here and said he'd had "the most fun I've ever had on a golf course" and he's played a few! 18 holes. Par 70. 6,514 yds. Links. Golf Dornoch. The Royal Golf Hotel. The First Tee Grange Road, Dornoch, Dornoch IV25 3LG, Scotland. Situated on the first tee of the famous Royal Dornoch Course. The hotel is beautifully located on the Dornoch Coastline offering a tranquil base to discover the treasures of the surrounding Highlands. Guests can enjoy a meal in the hotel restaurant or a relaxing drink in the hotel bar area. Golf Dornoch. Find the best deal, compare prices and read what other travelers have to say at TripAdvisor. Dornoch Castle Hotel, Castle Street, Dornoch IV25 3SD, Scotland. Castle Hotel incorporating portions of 15th-century Bishop's Palace and modern wing. Find the best deal, compare prices and read what other travelers have to say at TripAdvisor. Eagle Hotel, Castle Street, Dornoch IV25 3SR, Scotland. Find the best deal, compare prices and read what other travelers have to say at TripAdvisor.